That’s fun to say. Try it! 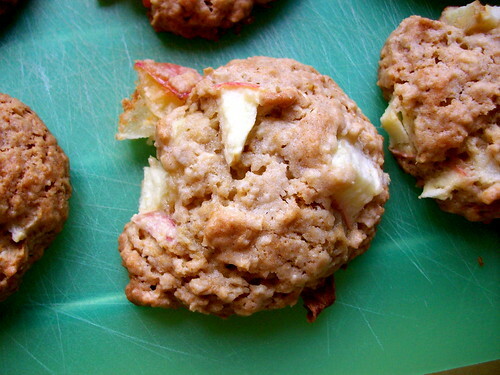 “Apple cookie epiphany.” Now say it five times fast. Seriously, try it! Nick has been asking for these cookies ever since he moved out of his parents’ house (now you know how long we’ve been together), but I thought I had to get the recipe from his mom, and I have a terrible memory. So he’s suffered for years because it never occurred to me that I could make cookies and just put apple in them instead of chocolate chips! The next time you see my husband, tell him that you are sorry he’s had to live with such an unthoughtful wife for so many years. Give him a hug, and tell him that there’s hope for me yet. 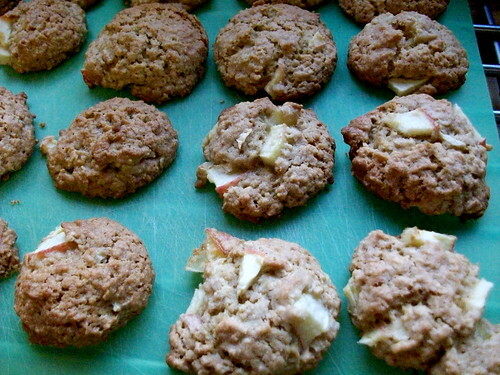 When I had my apple cookie epiphany, I didn’t want to use my go-to amazing oatmeal cookie recipe. Why? Well, because it isn’t the most health-conscious recipe. At all, really. I mean, it has oatmeal, which is good. And eggs, which are good too, but it also has quite a bit of butter and flour. Both good in moderation, but these cookies had never heard the word. So, I decided to just “tweak” my recipe a bit. 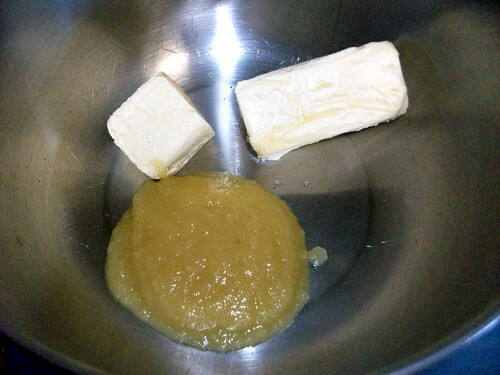 I replaced some of the butter with applesauce. 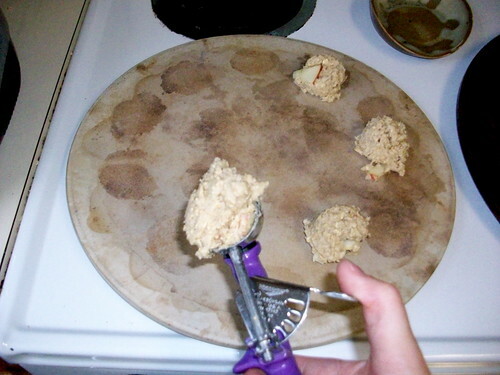 I figured if you’re gonna make apple cookies, why not go all out with the apple flavor? 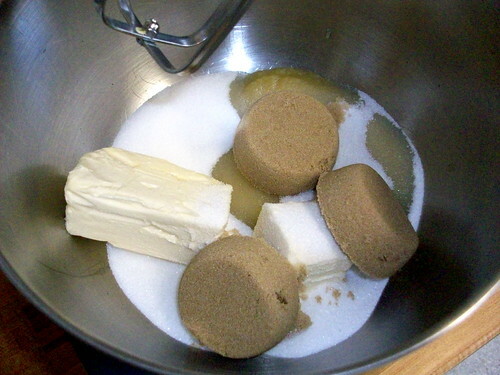 I reduced the amount of both white and brown sugar. Next time (yes Nick, I plan to make these again!) I think I’ll further reduce the amount of white sugar and increase the brown sugar. 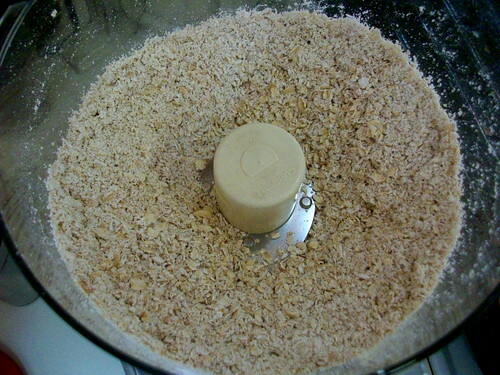 You don’t want to blend them too fine though, because the oat flour adds the perfect texture, as well as oat flavor. 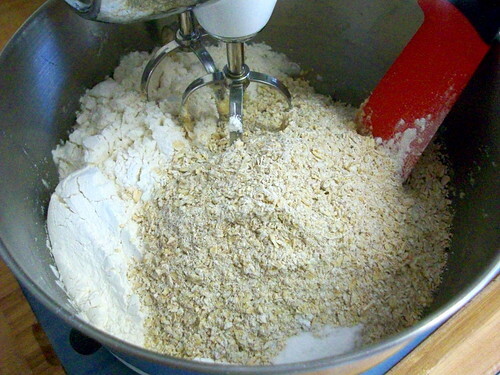 I added the oat flour, some regular flour, baking soda and baking powder to the butter mixture, and then just barely combined all the ingredients. You don’t want to over mix these cookies, or you’ll end up with a dense, sticky, delicious mess! 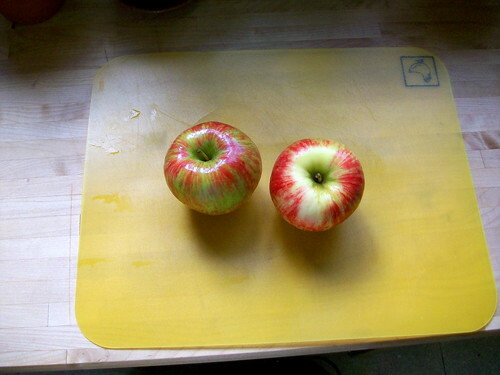 I then took two gorgeous honey crisp apples, diced them and added them to the dough. At this point, I had to switch to a wooden spoon to combine everything. After that, I dropped the cookies onto my stoneware pan and baked them. Perfectly soft, perfectly appley. I loved that the actual cookie wasn’t too sweet, because it really let the apples shine through. You could eat these with coffee, tea, for breakfast, for dessert… When I asked my poor deprived husband how they tasted, he replied with a quick “good,” but most of the cookies have disappeared since then, leaving me to believe that he likes them. My son, who did not inherit my sweet tooth, asked for a cookie for breakfast this morning, so you can believe me when I say that these cookies are delicious! Have fun with this recipe, and let me know how they turn out! Preheat oven to 375F. Cream butter, applesauce and both sugars. 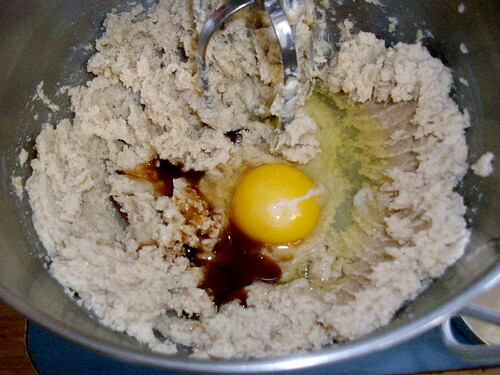 Add eggs and vanilla and mix. 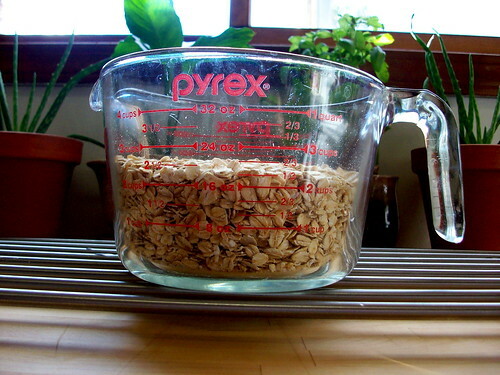 Add flour, oats, baking powder and baking soda and mix just to combine. (If you don’t get the last dusting of flour mixture to combine, it’s ok, because you’re still going to have to add the apples. 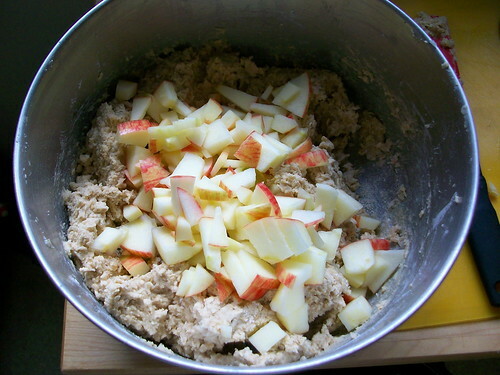 The moisture from the apples will help grab the last bit of flour.) Add the apples and combine. Drop onto a cookie sheet or stoneware pan, and bake until golden brown. The baking time depends on the pans that you use. With my stoneware pans, it took anywhere from 15-20 minutes, but with a metal cookie sheet, the time is shorter–about 10-15 minutes. Hello. Way to tweak the cookie recipe. High five. They look like they are good, nice and puffy and chunky. Nice pictures, too. Got cinnamon? I like to play with cookie recipes too, and I always reduce the sugar. AND, honeycrisps are my all-time fave. Spoon some ice cream or yogurt in a bowl, add cookie, drizzle with the carmel sauce you made AND that is gonna be awesome! Caramel Apple Cookie Ice Cream! Shut the front door! Previous Previous post: I’ve Changed My Name!